This creamy, dreamy Ham & Parmesan Risotto has especially humble roots because it’s made from leftovers! Yep, leftovers from my Pre-Easter Not Your Father’s Root Beer & Bourbon Glazed Ham, and a few odds and ends from the fridge. I’m always chasing after something new and wonderful to do with Ham, though, and so was born this lovely Ham & Parmesan Risotto. Risotto is like a blank slate for leftovers. I mean, really, who could guess leftovers were at all involved in this gorgeous dish! See how I cooked Not Your Fathers Root Beer & Bourbon Glazed Ham on a rack so it would be easy to get the drippings before it was glazed. In the meantime, I have BIG news – this Ham & Parmesan Risotto was done in the Instant Pot. The Instant Pot does cook differently than my stove-top pressure cooker, so there’s a learning curve. Now, the Instant Pot as a pressure cooker has pretty much the same positives and negatives as my stove top pressure model. If you’re thinking of getting an Instant Pot, read what Melissa Clark of the New York Times has to say. One thing a pressure cooker does very well? Risotto! I’m posting this Risotto with Ham and Parmesan recipe with instructions on how to make it in a pan on the stove-top as well as how to make it in the Instant Pot. How about you? Have you jumped on the Instant Pot bandwagon yet? 1 – 2 cups any additional fresh or cooked vegetables to stir in at the end, a few peas, sliced cherry tomatoes, cooked corn, green onion, etc. Set the Instant Pot to Saute and pre-heat. Add the olive oil, 1 tablespoon butter and onion, stirring now and then for several minutes until the onion is translucent. Add the rice and lightly toast, stirring often, until the color changes from white to translucent around the edges and then continue for a minute or two more, stirring, until a few of the grains are starting to look golden. Have your wine at the ready in case the rice needs the addition quickly if it looks as if it’s going to far. If the risotto is done to your liking, immediately remove the inner pot (so the rice doesn’t continue to cook from the heat.) The risotto should look just a little wet. If the risotto is still too wet for your taste, keep the pan in the Instant Pot and set to saute, stirring until the Risotto reaches the right tenderness & consistency, then remove the pot immediately. Again, the risotto should look a little wet. If risotto seems too dry (it should flow like lava and will thicken upon standing) stir in additional stock. Add the ham and any additional ingredients (see list of suggestions in recipe list or add another favorite) and stir for about 30 seconds. The rice will continue to absorb the liquid. Taste for salt and pepper, add if desired, then add the butter and Parmesan and quickly stir in. The Parmesan will thicken the Risotto more, and if it seems too dry, add a bit more of the additional stock. Serve immediately on warmed plates with additional Parmesan sprinkled over the top. Note: the stock amount given is approximate. You may need a little more or less. If you end up needing more stock and you find yourself without, just use water. Add the olive oil, 1 tablespoon butter and onion, stirring now and then for several minutes until the onion is translucent. Add the white wine and stir until the wine is fully evaporated, slowly stirring. Once the wine is almost completely absorbed, add 3 cups of the hot stock and stir, and continue to stir now and then (once every three of four minutes) for about 12 minutes until most of the stock is absorbed and the bottom is nearly dry. Gently stir in the ham, any vegetables, salt & pepper to taste, Parmesan cheese, and the butter. Add additional stock if it needs to be moistened. Serve immediately. Want to buy an Instant Pot on the cheap? Check Craig’s list, the paper, your second-hand stores, and consignment shops. Many people buy appliances like this thinking they are going to be the “be all to end all” and then try them once or twice (or never use them) and get rid of them. If you’re not using an item like this, it takes a considerable amount of space to store it in. Ask friends and/or relatives if they have one they no longer want. After the initial honeymoon phase, they might not be so attached. Perhaps they’ll gift it to you or sell it to you for a decent price. Buy on Amazon, new, used or refurbished. Wait until Amazon has their Prime day or shop on their Black Friday or Cyber Monday sales. Locate food bloggers who regularly use the Instant Pot and post about it. They may have giveaways or special deals where you purchase an Instant Pot by clicking through their links to a retailer. You’ll get a discount, they’ll get a small piece of the action. Win Win. I’ll be sharing this post at Angie’s Fiesta Friday! I see some truly marvelous posts from other food bloggers there already!! This entry was posted in Click here for Bargain Meals, Click here for Fabulous Food Posts and tagged Alcohol, Cheese, complete skillet meal, Frugal Hausfrau, Ham, Instant Pot, leftover ham, Leftovers, parmesan, planned leftovers, Rice, Risotto, Wine. Bookmark the permalink. Looks yummy Mollie! The insta pot is already paying off!! And I agree on the leftover ham! Do we really get to see 12 days of ham leftovers? My favorite– bean soup and scalloped potatoes & ham (my mom’s specialty). This risotto looks like excellent ham use! hugs hugs! I’m having fun with the instant pot! Those are my two fave recipes to make, too! And yes, on my blog I have a post 12 days of ham AND 12 days of turkey! Thanks Mollie– I’m looking them up!! hugs! The risotto look fantastic, pretty easy to make but all ingredients are so yummy! I appreciate the reblog! I see you posted in April and I somehow missed the notification. I think I would like to raid your basement, lol!! One of my girlfriends keeps saying the same thing, about my basement 😂 When she was getting married a few years ago, she needed tulle for decoration and guess what? Found it in my basement. A bale of it! Haha 😂 Not sure why I had it. I love it when leftovers become something new and delicious! I have to say that some people don’t like leftovers but I love them! They’re like a shortcut to other wonderful meals. Thanks…a fun way to use leftover ham! Thanks Sandra! I love ham, but like the leftovers even more!! I am embarrassed to say that I have had an insta pot for some time but only used it once. I made plain white rice with it but it didn’t turn out as well as my 35 year old rice cooker. I think I need to give it another chance. Thanks for posting, risotto and fried rice are my favorites for using up leftovers. Oh mine, too, Liz! I had a bit of a problem with the rice I made – it was pretty sticky (although the risotto was lovely) and I think I just need to experiment a bit with it. I have heard people with rice cookers say they like the rice cooker rice better. 35 years?!!! You’ve gotten some good use out of that!!! For a few years in my wild and crazy single days, I dated a Japanese man and he gifted it to me. I couldn’t cook for him unless there was rice included somewhere in the meal. It only has one setting and brown rice has to be cooked twice, but it does an amazing job. I have had a much longer and more satisfying relationship with it than I did him. I was surprised that the risotto I make at home with my stove top pressure cooker had quite a bit of timing difference than the electric one. It’s going to be a learning process! So what are you having for Easter? I’m sure it’s going to be great!! I don’t know yet, I can’t get the family to come to a consensus, lol! I made bread pudding in the Instant Pot Pressure cooker this morning and was lamenting that I couldn’t see inside! It IS like cooking blind and takes some trust. Thanks! I’ve never tried an oven risotto, nor heard of one but I’m very intrigued! I cook my brown rice in the oven and it turns out beautifully! I could see how a risotto would, too! I’ve already made rice (for Chance, my “labrador”able dog, who was ill two days ago! No flavoring in that, though! Arthur – we eat a lot of rice here (easy for my stepmom to get down) so I can’t wait to try your suggestions! I’ve never heard of an insta pot, I am afraid of pressure cookers, most likely it’s unfounded fear but I imagine it blowing up with food on my ceilings and projectile food and lid. I’ll have to look this one up. 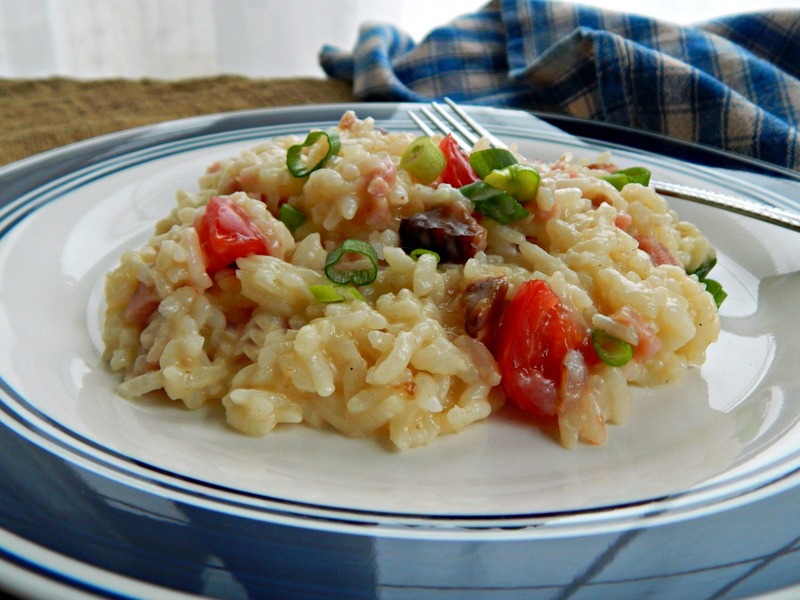 The risotto looks amazing, love me a good risotto as well and this is a great way to use up some leftover ham. Have a wonderful Easter holiday Mollie and family and how is Chance doing?? I think the younger generation has an easier time embracing the pressure cooker, though, because they didn’t have the legacy of the exploding pressure cookers we grew up with! They’re so much better now, both the stove top and electric.